The Reading Eagle has filed for bankruptcy protection and will be auctioned in May. Donna Reed, a Reading City Council member, is a former Eagle reporter and columnist. The Reading Eagle has filed for bankruptcy protection. Partly owned by two of the richest families in America, the Barbeys and DuPonts, and where famed Rabbit, Run novelist John Updike got his start, the Reading Eagle is losing $250,000 a month and will go to auction on May 17. It’s the latest bad news for the newspaper business and a blow to such towns as Fleetwood, Boyertown, Douglasville, and Womelsdorf, just beyond Philadelphia’s northwest suburbs. There’s talk of a local group of investors who might bid on the distressed company, which owns modern presses in downtown Reading, the WEEU sports-talk and news radio station, and an events-planning arm, officials say. Part-owner and CEO billionaire Peter D. Barbey, who has subsidized the paper’s losses, could buy it out of bankruptcy court as a credit bidder. Through his private firm, BWH Media, Barbey acquired a $17 million troubled loan secured by the Reading Eagle Co.'s assets from Santander Bank in 2016, according to a March 21 bankruptcy court declaration. Black Walnut Holdings LLC, also a Barbey firm, is owed $10 million in a separate unsecured loan, based on an April 1 court filing. The Reading Eagle’s $17 million debt dates to a badly timed modernization and expansion of the printing presses and distribution center on Penn Street in Reading in 2008, an economic decision exacerbated by the recession and a migration of local advertising to Facebook and Google. 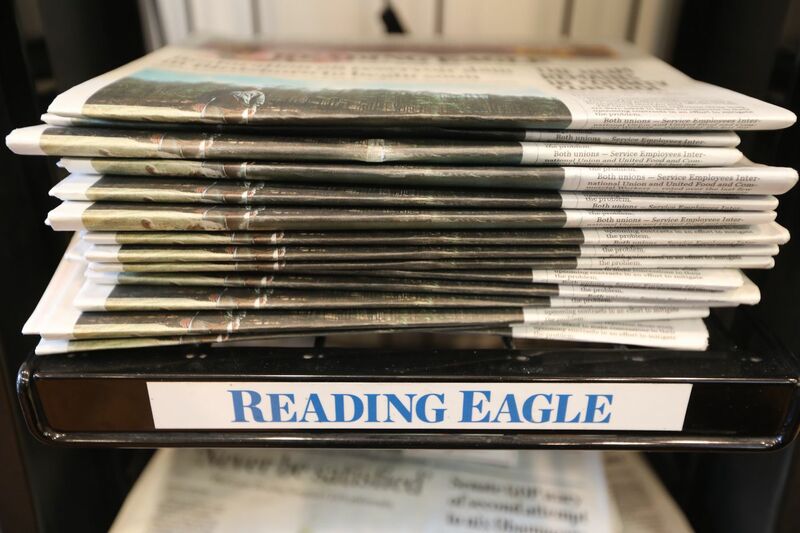 The Reading Eagle lost $4 million on $28 million in revenue in 2018, bankruptcy documents show. “The only large pool of costs available to cut are now in the newsroom, which cannot bear the millions of dollars of cuts,” the documents say. If a new owner believes it could turn last year’s $4 million loss into a $2 million profit, the company could sell for $7 million to $8 million, Newsonomics media analyst Ken Doctor estimated. Court documents say the auction will start at a minimum of $5 million. Firms will be able to boost their offers by increments of $100,000. Buyers of papers such as the Reading Eagle include Gatehouse Media, Digital First Media, and the Tribune Co. All three own newspapers in eastern Pennsylvania and could consolidate printing, page production, and copy editing, industry insiders say. Barbey made headlines in New York when he bought the Village Voice in 2015. Two years later, he ceased publication of the iconic alt-weekly. The Voice still exists online with digitized stories from its past, and Barbey still owns it. He also bought a $26 million three-bedroom apartment in Greenwich Village in 2016. “The upside is that [Barbey] has invested a lot in the [Reading Eagle], but this also means he’s likely to control what happens in the bankruptcy case. As the principal lender, he’s in the driver’s seat as the case develops,” said David Skeel, University of Pennsylvania law professor and bankruptcy expert. The Reading Eagle faces an uncertain future. The Reading Eagle circulates 37,000 papers daily and 51,000 on Sundays. The company, including the radio station, a Schuylkill County weekly, and a website with 3.2 million page views a month, employs about 235. Many family-owned local newspapers sold out over the last decade, cashing out for inheritances. Because the Reading Eagle owners may not feel the same urgency for economic self-preservation, they held on, said Doctor, the media analyst. About 95 percent of family-owned newspapers remain profitable, he said. The Eagle was founded by Jesse G. Hawley and William S. Ritter in 1868 and has been owned by Hawley’s descendants since then. Barbey’s family owns part of the publicly traded VF Corp. whose stock has soared with the popularity of such style brands as North Face and Timberland. Peter Barbey owns 15.6 percent of the Reading Eagle, according to court documents. Siblings John E. and Pierre S. DuPont, along with their sister Catherine Varacchi, own a total of 15.4 percent of the Reading media company through trusts. The Flippin clan own the rest. Adding celebrity to blue blood is 1980′s Hollywood actress Lucy Flippin, who owns a sizable chunk at 18 percent. Now retired, Lucy Flippin has credits including Little House on the Prairie and Flo, and the big-screen hit Flashdance. Staffers who asked not to be identified because they were not permitted to speak about bankruptcy said they are just waiting around for something to happen, with a looming sense of dread. The Reading Eagle put millions of dollars into new presses and an expansion at its downtown location. The debt still haunts the company. Reading Eagle employees say the newsroom is still well-staffed but they fear what may be coming. In late March, Pennsylvania Attorney General Josh Shapiro charged the cofounder of a Bucks County drug treatment company and 10 others in a wide-ranging fraud-and-kickback scheme. Reading Eagle investigative stories brought the treatment company, Liberation Way, to Shapiro’s attention. A reader views the last print issue of the Village Voice newspaper, featuring a Fred McDarrah photograph of Bob Dylan, in New York on Sept. 21, 2017.